It was pretty orderly, Madrona. A friend who owned a fish boat until the 1990's was telling us that a lot of fishermen are not going out after herring this year because the price for them is so low...good news for the herring and wildlife who depend on them! How long does this fishing season last, Madrona? It's not usually too long. Due to the early fall rains, Quinsam River Hatchery has had some high water episodes. One visit, the gates were locked so we were unable to go down to the counting gates. The water was up over the road. The high river incidents create problems for the crew...debris washes down and dams behind the gates. As a result, they open the gates to send the debris on its way downriver. 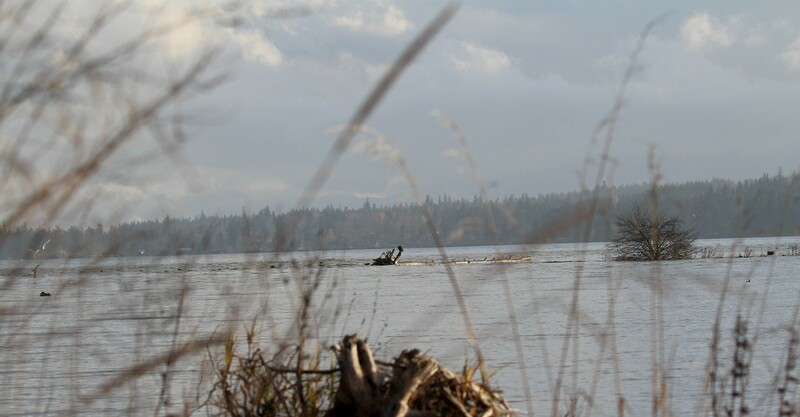 Usually, this time of year, you will find a fellow sitting up there, with one gate open and a counter in his hand counting fish going upriver. No can do this year. 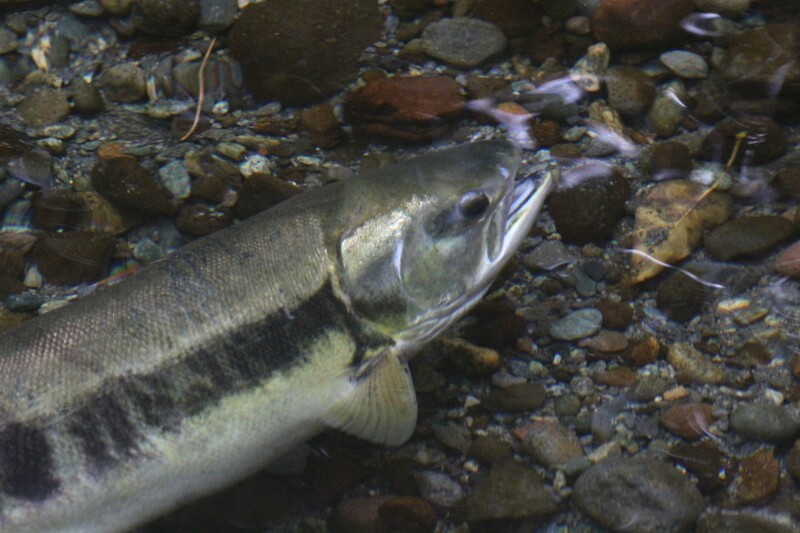 The high river has brought both chinook and coho up at the same time, so they are very busy. Coho don't usually arrive until the first heavy rain of the fall in early November. Everything is different this year. Here's a short video of my favourite place to visit in the fall. Personally, we haven't seen any bears this year, but a Mom with two cubs have been reported in the area. Fabulous video Sandor, thank you! On Thursday I was on Vancouver Island and checked the Big Qualicum River on my way south in the morning, and again when I returned in the early afternoon. I saw just one Chum carcass deep in the water in the morning, and no fish seemed to be swimming up on either of my brief visits. Beautiful seabirds around but no eagles. Too early maybe? I remember a trip we took when I was eight years old. We stopped to watch the salmon counter on the Columbia River. It was so interesting to see how fast the person had to click the counter as the salmon moved upstream. We also saw them being counted in Alaska on a river there. 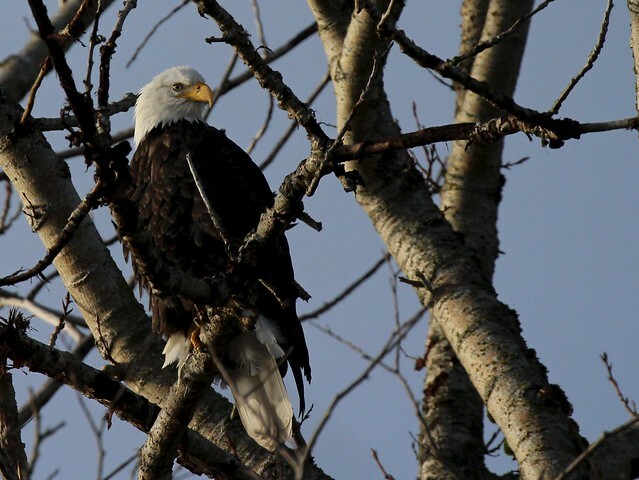 Last weekend I visited family near Squamish, which is near Brackendale, supposedly the Eagle Capital of BC. Two great rivers join the sea near Squamish: the Squamish River and the Mamquam. 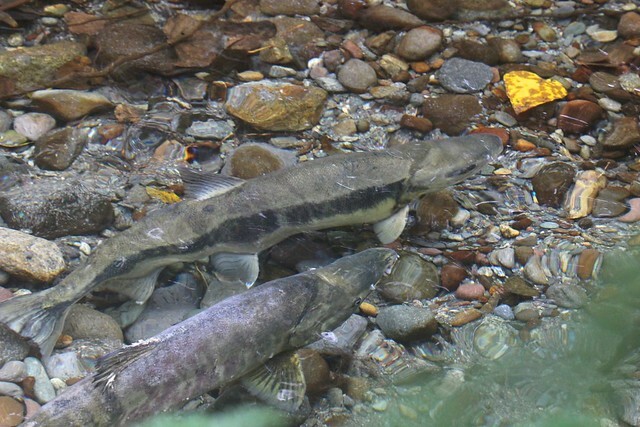 Pink Salmon, Cohos, Springs and Chums go up those rivers to spawn at various times of year. Some of them travel further up river to where the waters are calmer; others congregate in narrow side channels near the lower river. Humans used to find those channels just a bother of untidiness; therefore, the majority of the channels got filled in, cut in half by flood-control dykes and roads, strewn with refuse, or otherwise made useless. 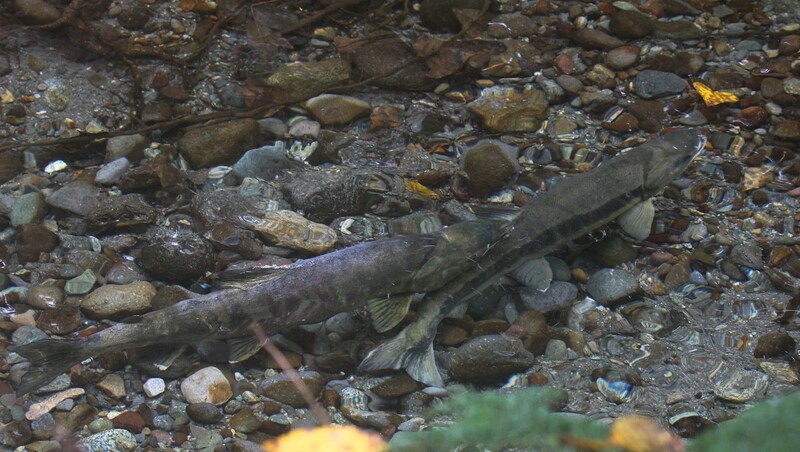 Until we finally figured out that they were supposed to act as a nursery for juvenile salmon. 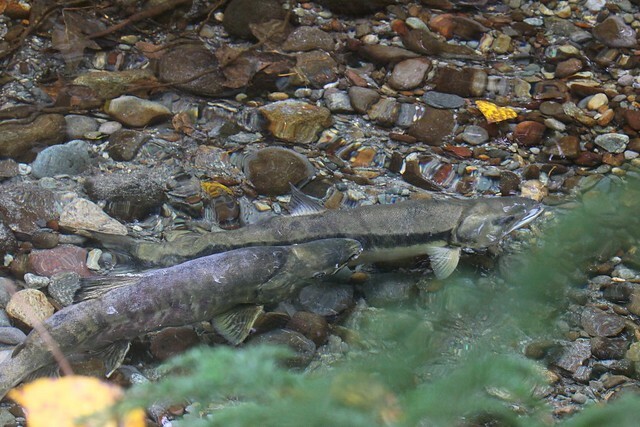 Now many of those spawning channels are being restored, cleaned out of garbage and reconnected to the main flow of the river. So on Monday I went for a walk among a maze of those channels along the lower Mamquam river. Some of the channels were empty but most had some fish in them -- all Chum Salmon. It's hard to get good photos of fish in the water without the right filter, so despite the amazing close views I had a lot of trouble, but the best sighting did turn out. 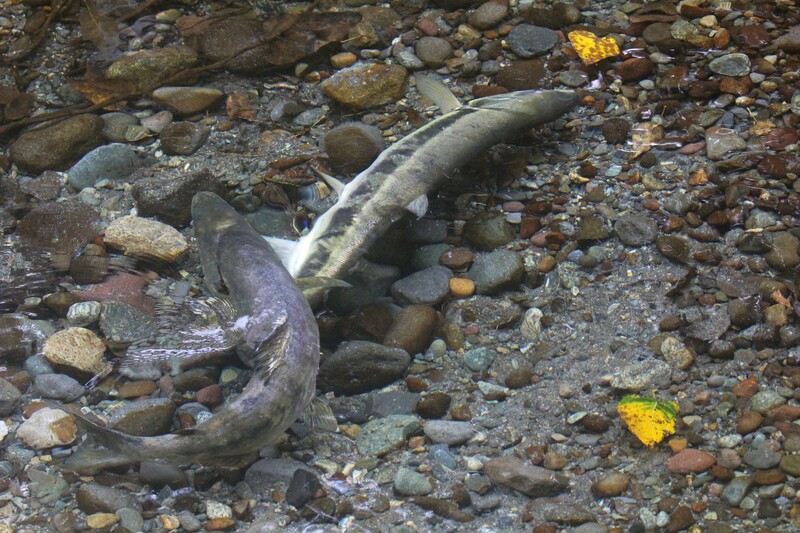 We found a pair of Chum Salmon, just below us. Shady bank, a channel only a few feet wide. At the bottom of that channel, the pebbles were covered in rusty-coloured algae; but below where these two fish were floating, the gravel was fresh. 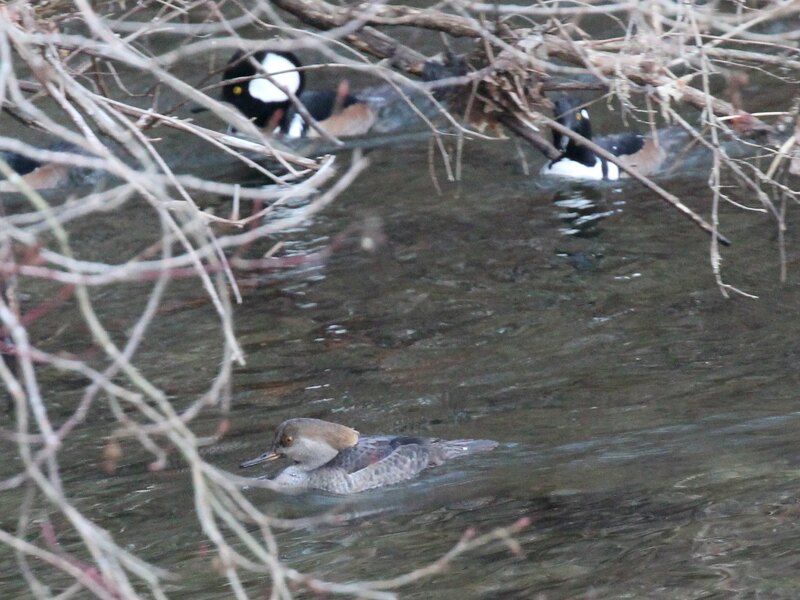 No pattern of current could account for that: this pair had moved the top rocks to start digging a redd: their spawning nest at the bottom of the river. The male is the one closest to us. He has some indistinct purple streaks down his side. The female is a little smaller and has a long dark dash all along her side. Nearby was another male, with his dorsal fin all torn up; this is part of the decay that starts as soon as the salmon enter fresh water. Far from a slapdash affair, the spawning process revealed itself as a long slow dance. 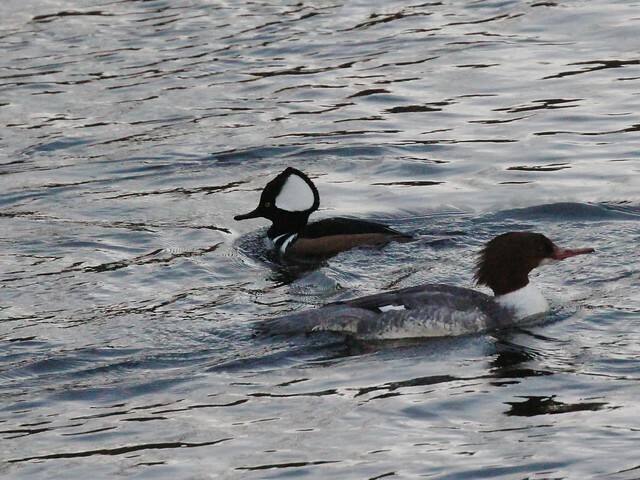 The female always in the lead against the current, the male hovering slightly behind. 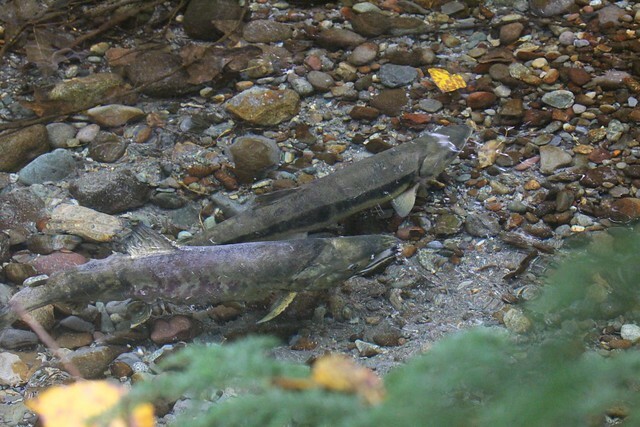 Every so often, the other male salmon would drift closer, and the spawning male would chase after. Then return to his long slow dance. Once in a while his whole body would vibrate for a few seconds. And once in a while - not clearly in response - she would do the same, but with her body tipped to the side. Click on this photo to enlarge it... 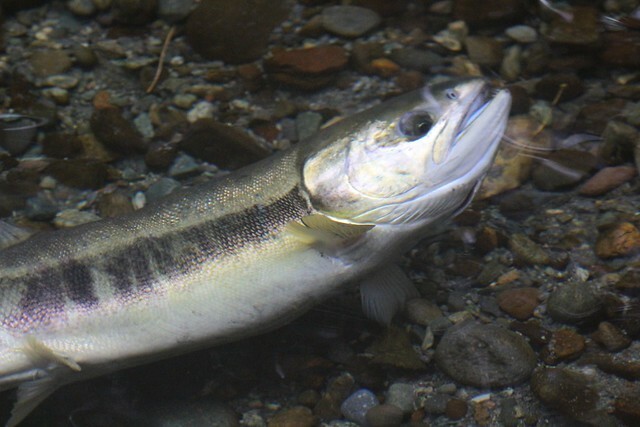 It shows a better view of the male's lower jaw, which has curled upward and sideways, one of the many effects of the move to fresh water after a lifetime in the ocean. 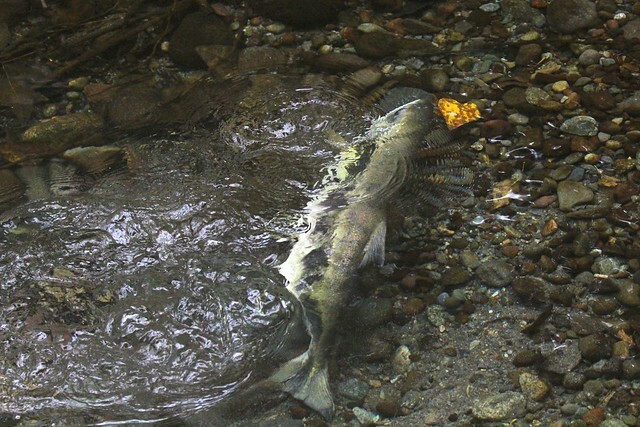 The salmon don't eat after they enter the rivers. The female's jaw is not deformed in that same way. 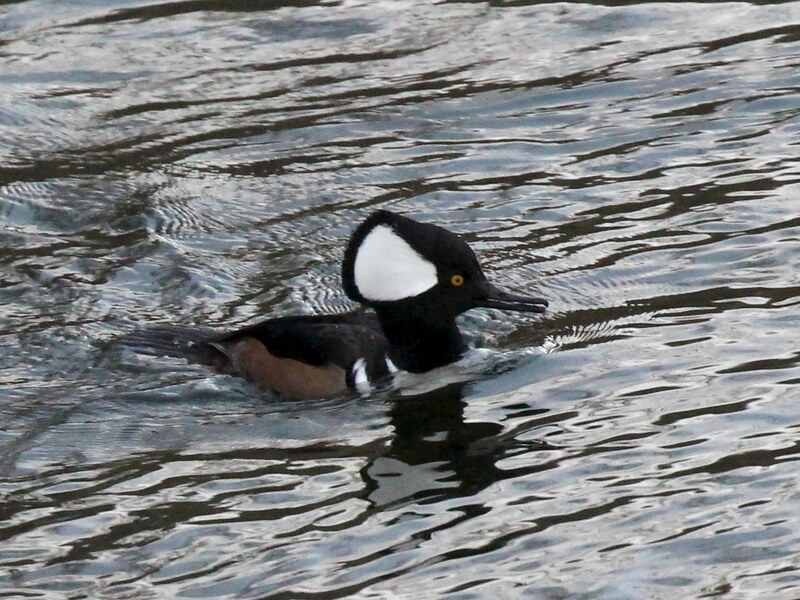 Here she is, turning on her side again and flapping her body - possibly displacing more pebbles from the bottom to deepen her redd. It seemed that she was not at all laying eggs yet. How long does that dance last? It seemed stately and reverent. I felt privileged to observe this from so close for a short while. Thank you for the pictures and narrative, wren. Very interesting. Two days ago I made a trip to town and had an hour or two of rare free time; so I rode my bicycle along the Courtenay and Puntledge rivers. 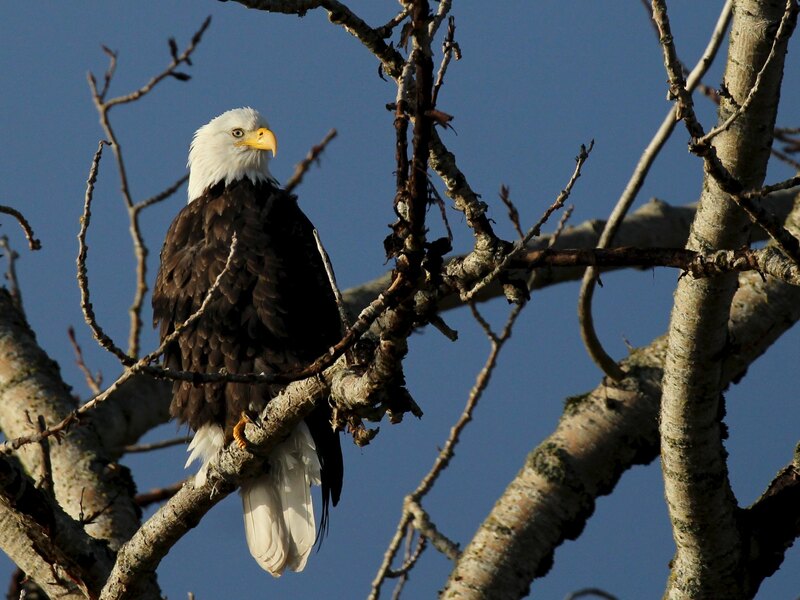 Dawn had brought back reports of many eagles along those rivers, especially out on the estuary. Most of my visit was under heavy rain so I have few photos. Eagles were scattered but they were everywhere; in back eddies of the rivers were piles of Chum Salmon carcasses, 'in the fridge' as Maj used to say. In Simms Park, right in the middle of town, I found a nice follow-up to my recent posts on this thread. Some changes were immediately evident. Project Watershed has sponsored the restoration of a spawning channel here too! This channel, situated near the eagles' nest, had been a dead end for years; a few salmon used to spawn there, but with so little water circulation, it is unlikely that their fry survived past the first weeks of spring; the water would become stale and muddy, and the juvenile fish would die from lack of oxygen. Now the channel has been extended and connected to a second, larger one, which in turn connects with the river, so it now forms a shallow but complete loop, through which the water circulates. Even when the river is low in summer, the renovated spawning channel receives new water from the river at each high tide. 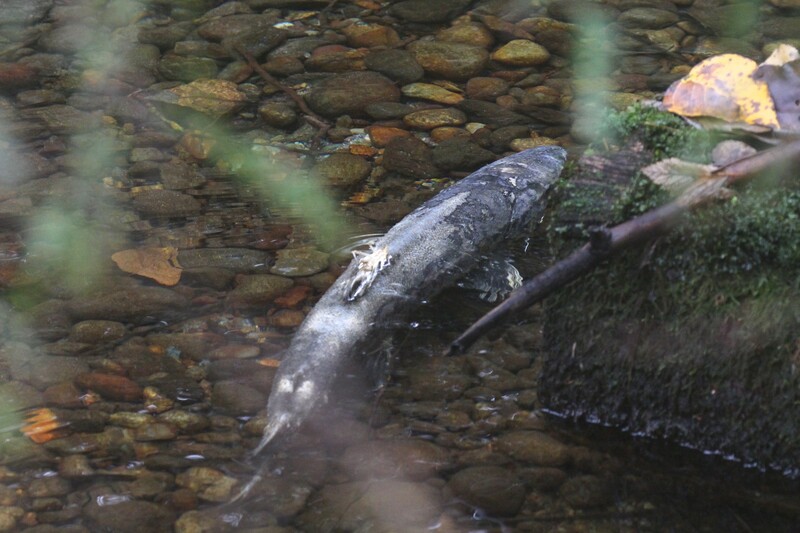 Already more Chum salmon have entered it and spawned there, judging by the number of carcasses. There will be enough shading and enough water circulation to give a suitable habitat to the salmon fry in their growing time here. Also, the information panels taught me one more piece of the puzzle: spawning channels are also important because they are a refuge from some of the predators. Seals and sea lions patrol the river quite high up, but the spawning channels are too shallow for them and they do not venture there. So that's another reason to protect those little bits of rivers that seem so untidy from an urbanized human's point of view. Courtenay River estuary, about a km downstream from Simms Park. In the afternoon the weather cleared and I made a quick visit through some of the same sites. A few eagles resting on trees and navigational markers and snags. One is visible on a snag in this picture. We are looking east toward Dawn-land on the far left of the picture. One eagle perched near where I parked. Same eagle, better light and viewpoint. Back to the upper (Anderton) bridge just before the light went away. This is where so many dead salmon lay piled at the bottom. 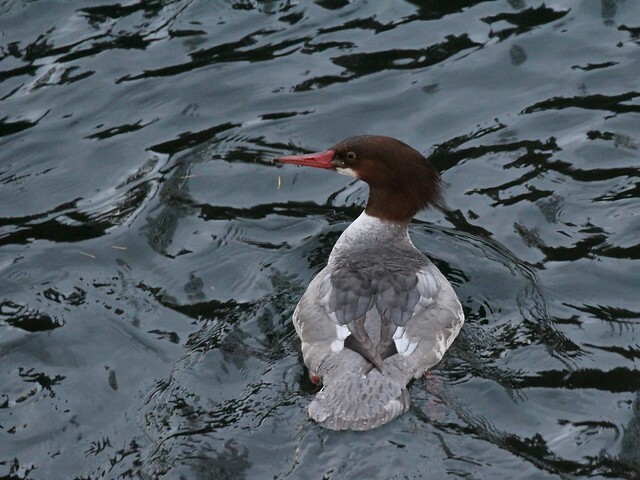 Common Mergansers floating down the current. 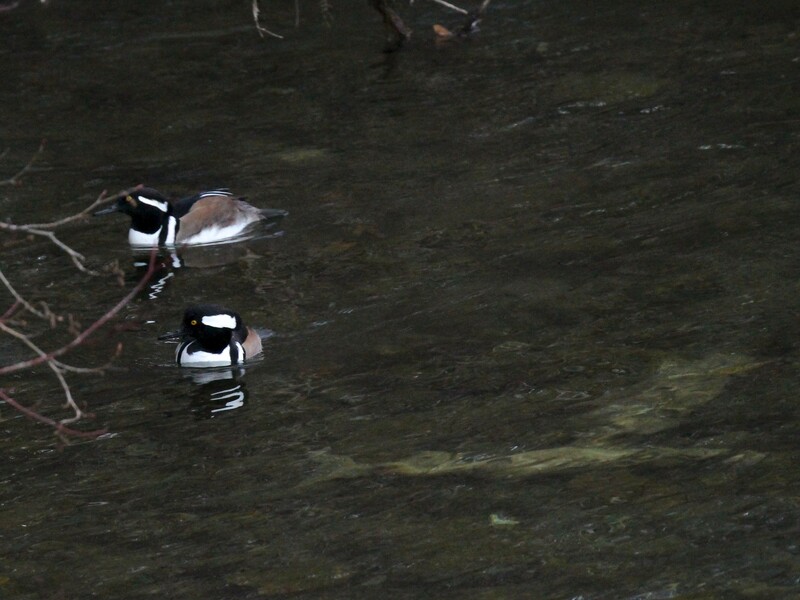 A rare treat: earlier I saw six Hooded Mergansers, and four of them are still there. Here's one next to a Common Merganser for scale. Female in the foreground, with her crest down; two males behind. Salmon carcasses visible underwater here; further downstream there were great piles of them. We're losing the light at this point.